Princess Disney Cinderella arrives at IyTG. 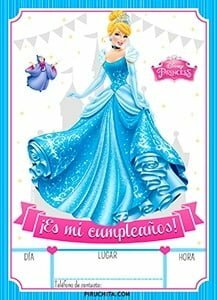 Get the free now Cinderella Birthday Invitation, with which to invite all your friends to your fabulous party. You can now download 100% FREE, in high quality for ready to be printed or send by Whastapp. Once again Disney, makes use of a version of a classic story to take it to the big screen. Cinderella is a story told by word of mouth for hundreds of years and of which there are different versions. Disney relied on the French version Charles Perrault of the year 1697, known for other stories such as Tom Thumb, Sleeping Beauty, Little Red Riding Hood and Puss in Boots among others. If you prefer something more personalized where you do not have to be handwriting the data with a pen, we can arrange to personalize it with your name, photo and an amazing design. Get them from only 7,95 € in www.Piruchita.com in digital format so you can print as many as you want or send them via Whatsapp. How many times have Cinderella-based birthday parties been held around the world? Surely many girls have put on a Costume of the Cinderella Princess at some point, and if not, even the oldest will be in time to do so. 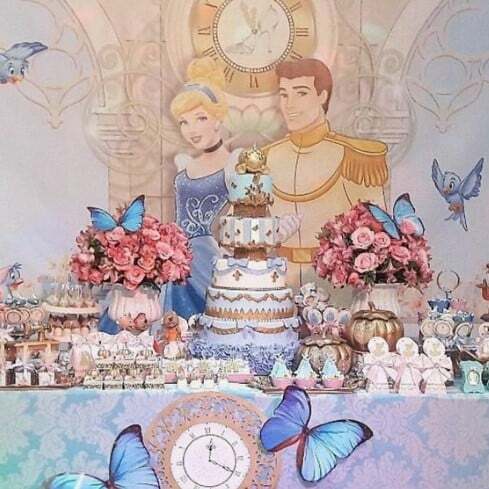 To organize a good Cinderella birthday party start with the Cinderella Birthday Invitation, Pennants and Boxes to put personalized treats with stickers with elements or characters from the movie. Now, if you can afford it, organize what can be a great memory for your daughter, and use everything you can related to the theme. 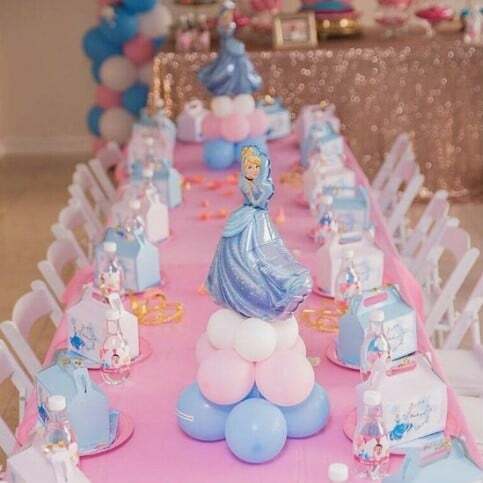 I give you some ideas: Cinderella plastic tablecloth, Cinderella glasses and plates, Cinderella balloons and all kinds of personalized decoration on paper. Do not miss our Custom premium decoration packs for Cinderella Birthday Party that we will personalize in digital format for you and you will be able to receive by working 24 / 48h. Print as many times as you want what you like the most and leave everyone hallucinated! The authors of this sweet table went to perform it in style. Notice that it even has three paintings with drawings of the Cinderella, but above all, look at the frames, they are beautiful. The flowers also abound in several places, both in front and at the bottom of the candybar. The cake in the center is surrounded by cupcakes and many other sweets. In this Cinderella birthday party they did not want to forget Prince Charming (whose name is unknown). Here stands out above all the gigantic birthday cake. But look around the cake, the abundant amount of sweets and pastries there, along with some decorations like flowers and also highlights the golden pumpkin. With pink, blue and benches, decorate the table where the little ones will eat. Balloons tied and a figurine above the Cinderella will make the theme clear. The boxes with sweets and individual welcome chocolates for each guest will make sure you do not forget your beautiful party. Get a beautiful decoration for the Cinderella birthday party. To the family, friends, parents of the friends of your daughter, but above all and mainly to your daughter, that for something that day will be the protagonist. 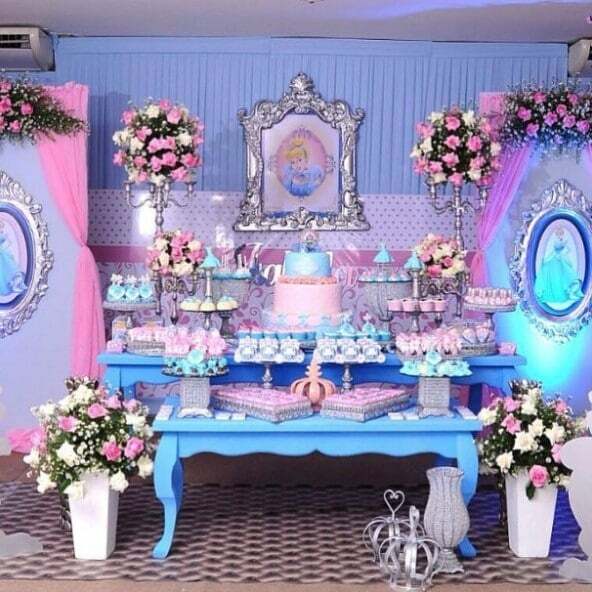 For this, you have Premium Decoration Kits for Cinderella's birthday party that we can customize for you with the name of the birthday boy / girl. You can get it here for only 19,95 € and in a term of work 48h you will receive it in your e-mail. All ready for you to print what you want and as many times as you need, without limit of uses. Cinderella is the only child born of the deceased and first wife of the first marriage of a wealthy noble widower who marries for the second time with an evil widowed woman who has two daughters of her deceased, first and former spouse of her first previous marriage so evil and with a heart as hard and cruel as hers. Cinderella's evil stepmother forces Cinderella to dress in old, battered and dirty clothes and to do all the chores of the house, in order to have the daughter of her second husband below her two daughters. Of these two, Cinderella's younger half-sister is less cruel to Cinderella. To marry the prince, his father, the king, organizes a big party in his castle and invites the young girls of the kingdom to a dance at a party in the castle that the Crown Prince of the throne will choose his future wife. When Cinderella's two step sisters and Cinderella's evil stepmother, Cinderella, who had to help them get dressed, go to the dance, she is forced to stay in the house. In the midst of her despair, Cinderella appears to her fairy godmother. Cinderella asks for help and the fairy godmother, making use of the magic of her magic wand, turns a pumpkin into a golden chariot. Then, the mice, rats and lizards of a trap are converted, also by magic, into lackeys, coachmen and horse thrushes. The fairy godmother brushes Cinderella with the magic wand, and then the dirty and damaged clothes that the girl wears becomes a lovely princess dress. 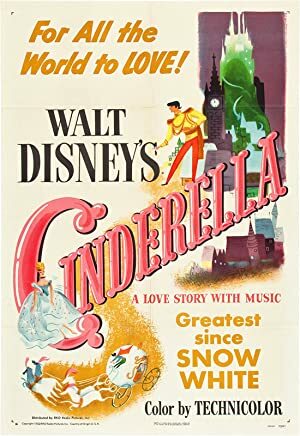 The fairy godmother also gives her some crystal shoes to Cinderella to take them to the dance, but she tells him that she has to come back before midnight, because if not, the spell will be broken. Cinderella goes to the dance, and there she is the most beautiful; not even Cinderella's wicked stepmother or Cinderella's two stepsisters recognize her. Before midnight, Cinderella slips out of the Prince's castle dance party and returns home. The next day, Cinderella returns to the palace for the second dance, and is even more beautiful, with another princess dress even more beautiful. As the midnight chimes start to play, Cinderella rushes off and loses one of the crystal shoes. The prince, in love with the girl, sends a footman to look for her. The glass shoe is tested on the girls of the kingdom, and no one can wear it, but Cinderella is easily fitted. At that moment the fairy godmother appears and turns the dirty and spoiled dress of Cinderella into a wonderful and beautiful dress worthy of a beautiful and sweet princess. Cinderella forgives her wicked stepmother and her two stepsisters, who will go to their wedding and marry the same day with two nobles of the court. And everyone will live happily ever after. Remember your childhood with this nostalgic song. Cinderella lives with her stepmother and her two daughters. The three make life impossible for her and they have her working non-stop in the housework. But she establishes friendship with the animals of the house, which will help her to attend the Royal dance to which her mother does not allow her to go. The free Cinderella invitation can be downloaded below, but it has a small drawback: you will have to fill in by hand with a ballpoint pen or marker the data as the day and place of the event. In addition it will not include any personalized data. It can not be cheaper for a customized product. For only 7,95€ get it in 24 / 48h. La Cinderella birthday invitation is designed in high quality, 300 dpi, perfect for printing both at home with any type of printer, as well as in a printing or online printing service. The file will be visible in a few moments, wait, please.